Welcome to Villa Pura Vida, which is proudly managed by North American Standards (Nasplaya). Your spacious 4 bedroom, 4 bathroom villa is located in the private gated community of Playacar Phase 1. The house sits only about 100 feet from the beach and offers ocean views from the master suite and 2 roof decks, including views from the rooftop Jacuzzi. The house is split between 3 levels with the master suite on the second level with king bed and large wrap around, ocean view terrace with lounge chairs. 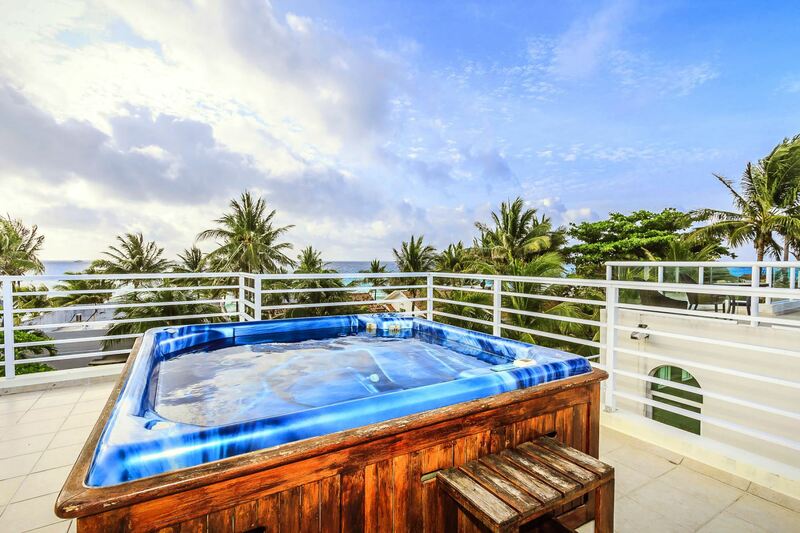 Then on the third level is another ocean view terrace, this one with a Jacuzzi. The first level of the home boast 2 more bedrooms and the main living area with kitchen, living and dining rooms. - Rentals of 1-4 months: Rate is plus electricity and a $1,500 USD security deposit. - Rentals of 4-6 months: Rate is plus electricity, TV, internet and water and a $1,500 USD security deposit.